Are children who are signed up required to attend Homework time? How long will Homework time last? How many Staff will be supervising Homework time? 4) Provide a suitable Homework environment: Ideally a room with tables and dedicated only to Homework time. If you have a large number of students or mixed ages you may want to make a seating chart. Try to minimize distractions as much as possible. Set up a corner where children can sign in and out and check out pencils, paper, dictionaries, rulers, erasers, and calculators (optional.) It is best not to have an electronic sharpener in the room as it can become quite a distraction. Try to have Staff make sure pencils are sharpened beforehand and if necessary hand out handheld sharpeners, which are much more budget friendly anyway. 5) Instill a Discipline Policy: The goal is to provide an atmosphere that is conducive for everyone to complete their Homework. 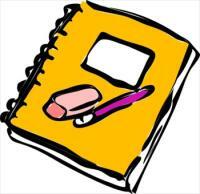 Set up Homework Club Discipline Guidelines and be consistent about enforcing them. Example~ 3 Step policy if children are being disruptive 1) Verbal Warning 2) Move their Seat 3) Dismissal from Homework Time. 6) Provide Rewards & Incentives: Reward positive behavior during Homework Time. Try to to recognize not only their good behavior but also how well they are staying focused on their Homework and completing it. You can use a Smiley Sticker Chart, and have a Homework Party after a certain number of stickers are earned. You can also put up a WOW Board, showing off children’s stellar work. 7) Have Break Time Before Homework Time: Try to have a 15 to 20 minute window between the time school gets out to when Homework time begins. During this break the children can relax, have a snack and then re-focus on their work without feeling burned out. Best of Luck having a successful Homework Time at your program. As with any new idea with children, you may want to adapt or change a few things here and there to fit the needs of your program.